TORONTO (Reuters) - Paulson & Co Inc will not support Newmont Mining Corp's planned $10 billion takeover of rival Goldcorp Inc as the premium offered is unjustified, the investor said in a letter on Thursday. The transaction is dilutive to Newmont shareholders and only Goldcorp shareholders would benefit from the deal's synergies, Founder John Paulson and Partner Marcelo Kim said in the letter to Newmont Chief Executive Officer Gary Goldberg. The transaction would also transfer to Goldcorp investors a significant proportion of the value from Newmont's recent joint venture with Barrick Gold Corp of their Nevada assets, Paulson said. "I think there is value-creation potential available for Newmont in buying Goldcorp at the current exchange ratio," said Christopher Mancini, an analyst at Gabelli Gold Fund, which owns both Newmont and Goldcorp shares. "Voting down the Goldcorp deal from a Newmont shareholder perspective, just because they'd have to share some of the synergies in Nevada, would be like cutting off your nose to spite your face," he added, declining to say how Gabelli will vote. Paulson said the firm would support a deal in which Goldcorp shareholders receive a maximum of 0.254 Newmont share rather than the 0.328 share they currently stand to get. "At this level, the transaction would generate value for Newmont shareholders while providing Goldcorp shareholders attractive consideration and an opportunity to participate in the shared upside of the combined company," Paulson wrote. 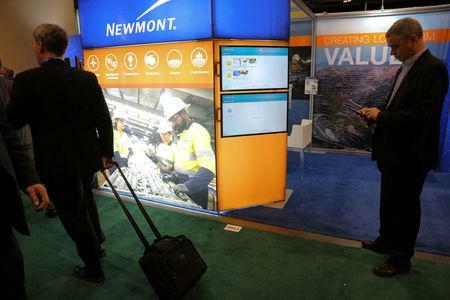 Newmont shares closed up 1.4 percent at $34.33 in New York while Goldcorp shares ended up 1.8 percent at C$14.94 in Toronto. "The benefit of the merger is in the long term; in the short-term there's going to be a lot of teething pains," said Robert Cohen, portfolio manager at 1832 Asset Management, which does not own shares in either company. "I wouldn't be surprised if the deal does come off the rails. But I don’t think Paulson & Co have enough clout."